With the release of macOS 10.9 (aka: Mavericks) Apple has taken another step forward in core system functionality. Mavericks appears to be focused on working towards a convergence of macOS with iOS, as seen in the inclusion of the Maps and iBooks applications, as well as in some of the ‘under the hood’ changes. Whereas many new core functions were introduced in macOS 10.8 — iCloud integration, enhanced Auto Save, Dictation and Power Nap in particular — that could directly interact with Helix in adverse ways, Mavericks does not include any new features with the potential of directly impacting Helix users. Unfortunately, one change Apple did make was to remove some older technologies. One of these is Open Transport, which is used to manage network communications in Helix Client/Server 6.2.1 and earlier. Consequently, attempting to launch Helix Client/Server versions prior to 6.2 in Mavericks result in an immediate crash; Helix Client/Server 6.2.1 displays a warning when launched, then shuts down gracefully. Single user applications (Helix RADE, Engine, and Utility) should encounter no problem running in Mavericks. Helix Server 7.0.3 and later automatically disable App Nap; these instructions are not needed unless you are running Helix Server 7.0.2 or earlier. 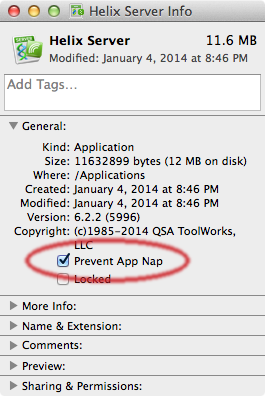 macOS 10.9 contains a new feature, called App Nap. This feature monitors running applications to determine what priority each should get in terms of processor, network and disk resources. Although this is desirable in general, there are situations where App Nap can have a detrimental effect on performance. In particular, putting Helix Server into a ‘low power mode’ can cause the replies to Client requests to be delayed, making Helix Client/Server performance visibly slower. Consequently, it is necessary to disable App Nap for Helix Server. To disable App Nap, quit Helix Server (if it is running), then Get Info on the Helix Server application (right click on the Server icon and choose ‘Get Info’ from the menu, or select the Server icon and choose ‘Get Info’ from the File menu) and turn on the Prevent App Nap option, as seen in the image on the right. At this point, Apple has not provided a way for developers to opt out of the App Nap process other than requesting that specific operations be exempt, which does not address the problem here. Unless Apple provides a way for us to programmatically disable App Nap, it will have to be done by you, the end user, on a case-by-case basis. Users who wish to disable App Nap entirely can find instructions for doing so on this page. Starting with version 6.2.2, Helix applications are fully compatible with Gatekeeper’s default mode. For older versions of Helix, macOS typically provides a clear message when Gatekeeper is blocking an action, but sometimes it responds with a more cryptic error code: “OSStatus error 100030”. For older versions of Helix, Gatekeeper offers a security level that allows downloading and installing applications from any source. See GatekeeperApple’s Gatekeeper technote for information on setting Gatekeeper to the appropriate level. In macOS 10.9.5, Apple introduced changes to the way Gatekeeper works. This may affect your ability to install Helix software, but we have not heard from any users who have actually been affected. if you have trouble installing Helix on macOS 10.9.5 or later, please contact us with the details. Since macOS 10.7, the “toolbar widget” has been removed from the upper right corner of windows, eliminating the ability to cancel a Quick Query or hide the Sort Order control once it has been opened. Helix 6.2 automatically adds a Show/Hide Toolbar command to the Edit menu to resolve this limitation. See R7234 in techdb for more information. Because the ‘Refresh’ button is found in the toolbar, Helix 6.2.2 automatically opens the toolbar when a cold form is opened. Users who dislike this feature can disable it by editing the HxShowToolbarForColdForm preference. See this page for details. Helix RADE 6.2.2 and later are compatible with Mavericks. Helix RADE 6.2–6.2.1 are compatible with Mavericks, as per the Gatekeeper note above. Helix Server 6.2.2 and later are compatible with Mavericks, as per the App Nap note above. Helix Server 6.2.1 and earlier are not compatible with Mavericks. Helix Client 6.2.2 and later are compatible with Mavericks. Helix Client 6.2.1 and earlier are not compatible with Mavericks. Helix Engine 6.2.2 and later are compatible with Mavericks. Note: Helix Engine for PowerPC — which is provided as a free upgrade for owners of Helix 6.0 licenses — is not Intel-native and therefore not compatible with macOS 10.7 or later. Helix Utility 6.2 and later are compatible with Mavericks, with the caveats noted above. Helix Utility 6.0 and earlier are not compatible with Mavericks. All collections must be updated to Helix 6.0/6.1 prior to moving to macOS 10.7 or later. See this technote for options available to update older collections. Helix Maintenance Manager (HMM) is Intel-native and compatible with Mavericks. However, since Helix Utility OS X and Update Collection are not compatible with Mavericks, HMM 1.0.x can not perform its intended duties. The future of HMM is currently undefined.